If Justin Bieber or Selena Gomez retweets then 20 million more people will know about Skyrush. Come on Skyrush, lets get popular. I don't think you'll have to worry about Skyrush not being popular. Once the ride opens, I strongly believe word will quickly spread around, once people get to experience it. Amazing new updates posted to Keystone Thrills. Doesn't show testing, but shoes some awesome shots, and updates! Thought I'd post a link to the update I posted on my Facebook page last Tuesday (the day before the first test runs on Skyrush). There are 68 photos in the folder. Lots of interesting stuff. markR wrote: Thought I'd post a link to the update I posted on my Facebook page last Tuesday (the day before the first test runs on Skyrush). There are 68 photos in the folder. Lots of interesting stuff. Oh wow, you're the guy from Front Seat Coasters? I love your videos. Thanks for posting, awesome pictures! WOW it looks as if it's always been there, fits in perfectly and looks great! Those lucky water dummies! Great photo. What's anyone's best guess on when they'll do Skyrush test runs again? I have videos from today that will be posted tomorrow. Like Skyrush rising up the lift. Wow all I can say about seeing that full speed testing vid is that is going to one an AMAZING!!! ride. As we near opening day, I'm sure we'll begin to see testing increasing within the next week. That full speed test run video of Skyrush is outstanding! Anyone know what day that took place? Was doing some rough calculations, and Skyrush should be about 52 to 55 seconds from first movement til the brake run. What does everyone think about that? If only from the standpoint of how Skyrush will be perceived by those who rank rollercoasters? Will this affect where Skyrush could possibly be ranked among hypercoasters? I, for one, am not bothered by this at all. The Kentucky Derby is known as the most exciting 2 minutes in sports. I say Skyrush will come to be known as the most exciting 1 minute in coasterdom! The fastest lifthill around; over the top and right into a huge, fast 200-foot drop; epic airtime hills that look ready to launch us to the moon; fast, sweeping turns everywhere; the ONLY Stengel Dive in the Western Hemisphere; not to mention the winged outer seats that promise some kind of view and ride. And, oh yeah -- no shoulder restraints! I could care less where Skyrush is eventually ranked by Amusement Today, though it is nice to see our local coasters recognized worldwide (as Knoebels' Phoenix always is among woodies). No matter where it ranks, those of us who get to go to Hersheypark regularly (fellow HP season ticket holders out there?!) 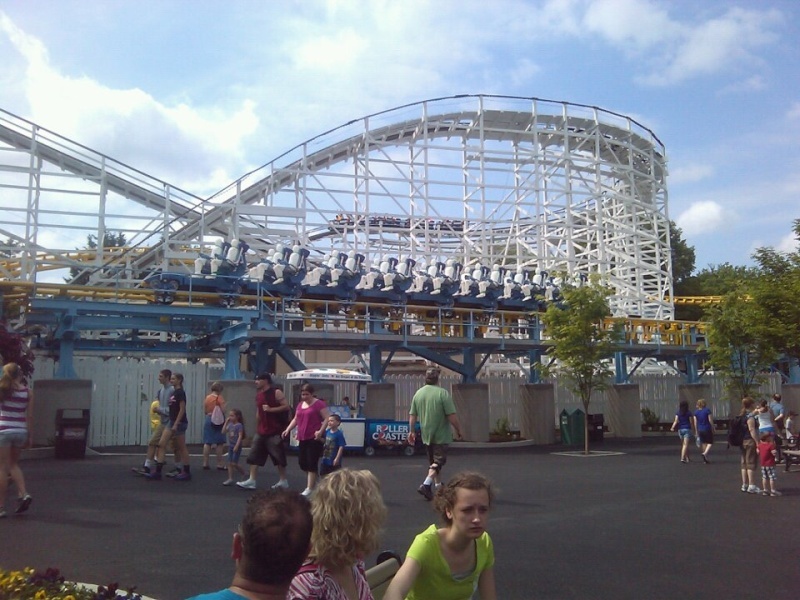 and ride Skyrush frequently will be quite happy! Also, with 2 trains running, and if loading/unloading goes quickly, they should be able to have quick turnaround times on Skyrush, perhaps making the waits not seem so long. That remains to be seen. WOW!!! I thought it looked amazing just with it crawling over the lift, but now it looks absolutely insane!! ^I think that its length will probably be the only thing that might hold this back. Even though its short it still looks like a world-class ride. And I'm more interested in where it will place in Mitch Hawker's steel poll rather than Amusement Today which doesn't include as many European coasters and is usually thought of as the better poll. And I believe that Maverick also has a stengel dive. Great post Mark and agree Skyrush will be the most exciting one minute in coasterdom. RoS/Bizzaro is my home coaster, which made me the Intamin fan boy I am today. The top rides world wide according the Mitch's poll do tend to have longer ride times. I've always said I think Skyrush will rank in the top 5 world wide and continue to feel that way after seeing the videos. Skyrush isn't like Leviathan where you have to wait 60 seconds just to get to the top of the lift for the ride to start. The thrills start immediately. When you look at Mitch's Steel Poll results Maverick places 13 in the world and #3 in the US. Maverick is 4,400 feet long while Skyrush is 3,600, but Mavericks ride time is twice as long. This is why I think Skyrush is going to rank so high, and just as high as I305 because it is going to be non-stop thrills from the moment it leaves the station, and certainly won't give up as it travels the course. So I think the shorter ride time on Skyrush will generates complaints, but think the ride itself will exceed expectations. Oh, I did forget to mention having lap bars only on a winged vehicle is HUGE - and hope - Intamin incorporates this restraint design on all their future coasters including loopers. Amazing video of Skyrush! Now it's really flying. Can't wait for opening day, and to ride the edge. I agree, I think it will rank very high on the Coasters List. BrandonStrouphauer wrote: I have videos from today that will be posted tomorrow. Like Skyrush rising up the lift. When are you going to post them? I love the picture of the lift from the monorail station and can't believe how fast the lift is. Skyrush is going to rock !!! The lift speed is only going to make the ride A LOT more better! Man im loving skyrush soooo much and i agree with the lift being so fast it will make the ride sooo much better! 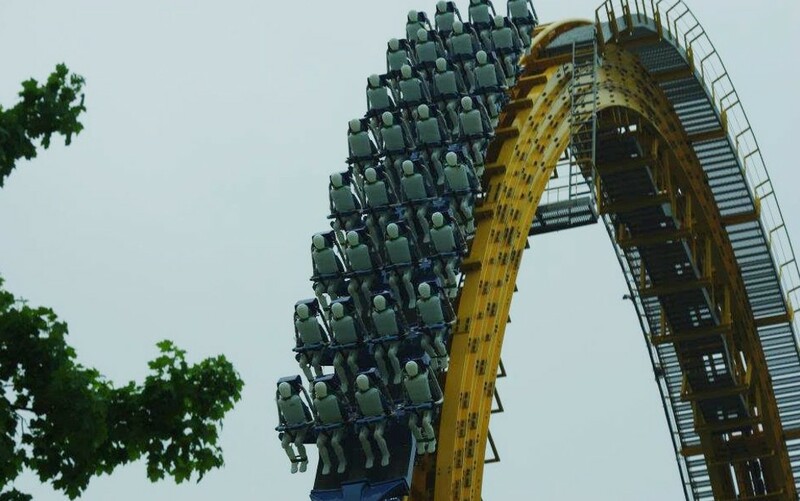 This coaster is going to be a award winner! BTW thom25 skyrush is not GOING to rock it DOES rock! YES - And All American Thrills (ALT), will be there all day tomorrow filming Skyrush and SDL.